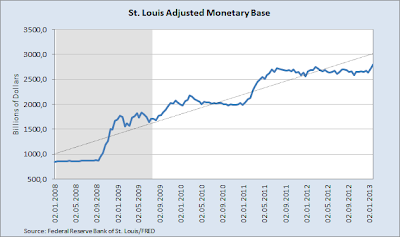 Following several months of declines since February 2012, the U.S. monetary base (base money) increased by a massive USD 162.96 billion during the last four weeks to set a new all-time high according to figures released today by FRED. At USD 2.796 trillion, it is 1.57% higher than the previous high set on 22 February 2012 and represents an increase of 4.2% compared to the same week last year. 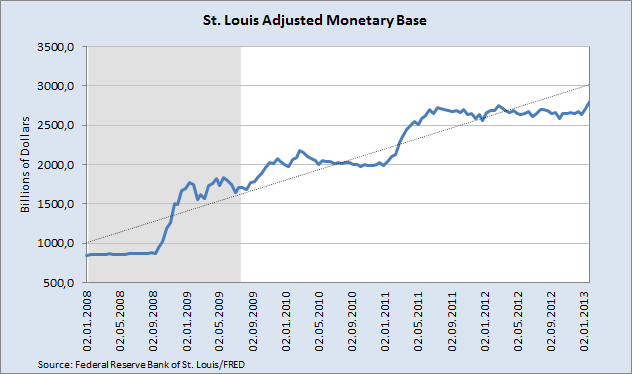 Given this growth in the money base one can reasonably expect money supply and bank credit to continue to grow rapidly going forward. This could certainly also help fuel further increases in the S&P 500 index and the stock market in general. The next financial bubble is well on its way.